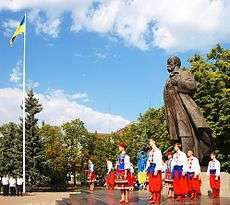 Independence Day of Ukraine (Ukrainian: День незалежності України) is the main state holiday in modern Ukraine,[nb 1] celebrated on 24 August in commemoration of the Declaration of Independence of 1991. Beginning in 2004, 23 August is celebrated as the Day of the National Flag. Generally independence day is celebrated with a military parade held in Kiev, Ukraine's capital. When Ukraine was still incorporated into the Soviet Union the Ukrainian diaspora traditionally recognized 22 January (the Declaration of Independence of the Ukrainian People's Republic in 1918) as Ukrainian Independence day. After the annual military parade in Kiev an "unbroken march" was held, which consisted of current serving members of Ukraine's volunteer battalions, relatives of those killed during the fighting in the War in Donbass and family members of those killed during the Euromaidan uprising – known in Ukraine as the "Heavenly Hundred". According to the Ukrainian army the volume of artillery fire set off by the separatist forces of the war in Donbass during the 24-hour period of 24 August 2016 was the highest since the February 2015 Battle of Debaltseve. Several Ukrainian cities held marches of people dressed in clothing featuring traditional Ukrainian embroidery. ↑ In July 2013 in a poll by Razumkov Centre 61% considered Independence Day a holiday, 30.4% “not a holiday, but an ordinary day off” and 6.1% agreed to “this should be a working day”. ↑ "Washington State Marks Independence for the First Time" (PDF). Svoboda. The Ukrainian Daily. LXXX (40). Jersey City: Ukrainian National Association. 3 March 1973. p. 4. ISSN 0274-6964. LCCN 80012518. OCLC 01766932. Wikimedia Commons has media related to Independence Day in Ukraine.